Cancer Fun Time! : Wanna See My Vacation Slides? One cool development in medical care in the past few years, especially for a geek like me, is that when you have medical imaging performed they will usually give you the images on a DVD. They did so for Progeny the Elder when she broke her arm recently. 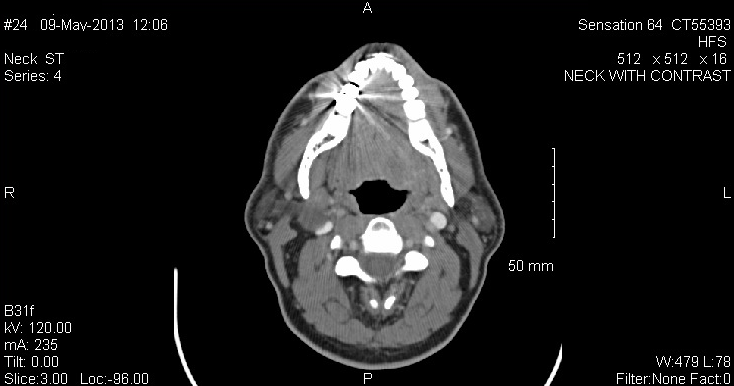 And they did it for me after the CT scan of my neck. I dropped by the hospital tonight and picked up the disc. It came with a bonus: a copy of the radiologist's final report. 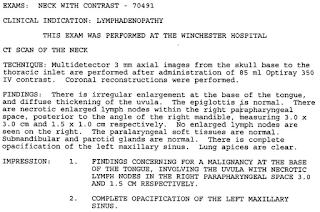 Remember, all I had see up to this point was the "wet read" - the preliminary report that the radiologist sent to Doctor W immediately after the scan. I'm not sure which terminology will be confusing to readers. Please feel free to ask questions in the comments and I'll do my best to explain the lingo. 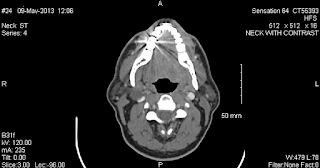 But at a high level what it says is that the anatomy is not normal and given the radiologist's training and experience the shapes that s/he sees are indicative if a malignancy. The report mentions suspicion that the uvula might be involved. Doctor B, the otolaryngologist, took a good look at in my initial consult with him and remarked that it was clear. In this post I described how a CT scan works and that it generates a 3-dimensional grid of data. And that one can then pass imaginary slicing planes through that grid to produce 2D images that look like x-ray films taken from arbitrary angles. 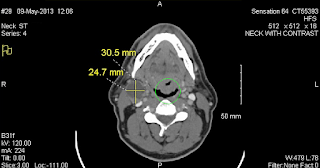 With the difference that when you look at a traditional x-ray film you are looking at the radiation that passed through the entire thickness of the body part that was imaged while in a slice through CT data you are looking at an actual slice a few millimeters thick. Like bologna. The DVD for a CT scan conveniently came with software that enables a user to navigate through the 3-dimensional space, i.e. to move the slice planes around through the data volume. I used that software to extract the images below. This image is a slice through my head, roughly parallel to the ground if I were standing up. If you remember from the CT explanation, that's called the transverse body plane. This slice passes through the lowest part of my jaw. You are looking up through my chin. 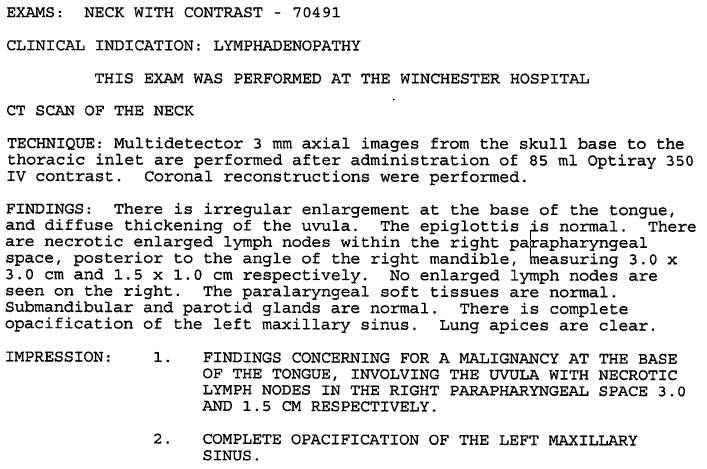 The yellow markings were made by the radiologist to measure Lumpy the Lymph Node. Lumpy is that big round grey thing under the yellow marks. The green circle was added by me and highlights the back of my togue. 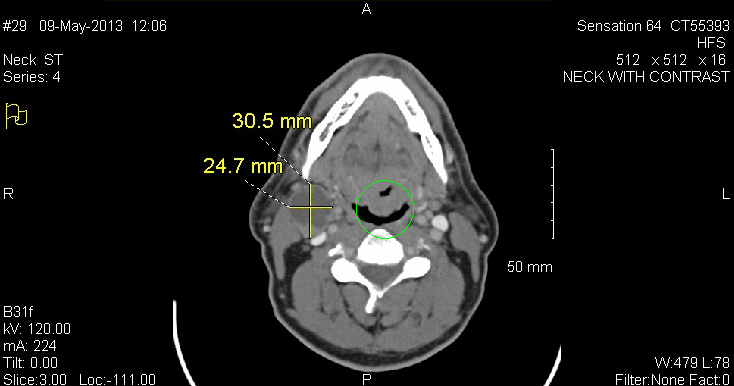 The black arc shape is my throat. It's black because there's nothing there to absorbe the x-rays: density = 0. Protruding into my throat is our guest of honor, the growth on the back of my tongue. Remember the bumpiness of it. I can't spoil the suspense by telling you just what it is yet but we'll get there. I'm going to have to give that guy a name, too. Repeat after me: "Click to embiggen." The next image is mainly for curiosity. I have a dental implant at tooth position 29 (lower right mouth quadrant). The implant itself is a titanium screw. That titanium screw acts like a mirror ball when all those x-rays are fired at it from different angles. You can clearly see the flare from the mirror ball in this image. You may now play radiologist and make your own diagnosis in the comfort of your very own home.